Improved Initiative: Need Cheap Minis? SCS Direct Has You Covered! If you're a dungeon master, then you know exactly how expensive miniatures can get. While there's nothing wrong with using tokens or cardboard minis (the sort you could download from Paper Forge, for example), there is something a little more real about using three-dimensional miniatures for your beasties. Especially if you want to assemble a small army of zombies at one end of the table, or you want to make it abundantly clear that the entire deck of the opposing ship is swarming with pirates. Buying that many miniatures isn't cheap, though... unless you hit up SCS Direct, that is. You know how everyone always tells you to shop for minis on the Internet, because that's where you find good deals? Well, SCS Direct is one of those digital storefronts I found on Amazon that has all kinds of awesome minis. Not only that, but it offers you packs of them for less than $20! 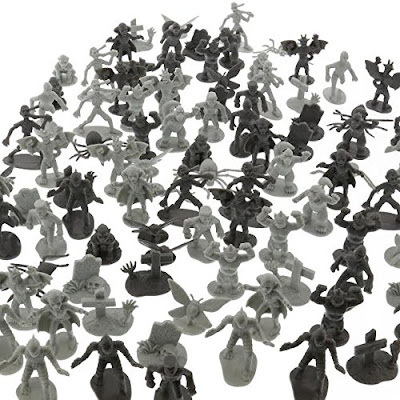 No matter what kind of game you're playing, these minis are something most DMs can afford, and even better they're made from durable plastic. You won't have to worry about fragile parts breaking off every time you move a mini, and they're distinct enough that there's no worrying about separating the monsters from the heroes. A major advantage if you like to run hoard battle scenarios. If you like more detailed minis then you might be a bit happier with the offerings in the Arena of The Planeswalker game produced by Wizards of the Coast, especially if you can find it and its additional packs like Battle For Zendikar or Shadows Over Innistrad at a fairly cheap price. But if you need bad guys to beef up your map, then the big buckets of goons might be just what the doctor ordered for your next campaign! That's all for this week's Moon Pope Monday post! If you've got a hot tip for getting cheap minis (or other bargain supplies for gaming) leave them in the comments below! If you'd like to see more of my work, head over to my Vocal archive, or just click my Gamers page to see only my tabletop articles. You should also consider heading over to the YouTube channel Dungeon Keeper Radio, where I work with other talented gamers making videos for players and DMs alike! To stay on top of all my latest releases, follow me on Facebook, Tumblr, and Twitter. If you'd like to support me, you could either Buy Me A Ko-Fi, go to The Literary Mercenary's Patreon page to become a patron, or check in at My Amazon Author Page where you can buy my books... like a copy of my sword and sorcery novel Crier's Knife! They look pretty cool, but some of the reviews point out they aren't really meant for D&D, being differently sized, and that the plastic is actually soft(one example being a horse rearing up touching the table in a few hours). That in mind though I'm definitely picking up the zombie ones for a friend. Thanks for bringing these to my attention!